The Music Man, ideally staged, is a great big, delightfuly corny slice of old-fashioned Americana. It’s been performed at the Muny many times, and this is the third production I’ve seen there. This year, although it’s still a bright, colorful, energetic show with some great technical elements and truly wonderful choreography, it’s somewhat marred by some awkward casting and some bizarre directorial choices. The story is a familiar one to many theatregoers. Professor Harold Hill (Hunter Foster) is a traveling salesman and smooth-talking con artist who arrives in River City, Iowa with the aim of swindling the townspeople with grand dreams of a boys’ band, and then running off with their money. What Harold doesn’t count on, though, is that this time he will get attached, particularly to earnest young librarian Marian Paroo (Elena Shaddow) and her family, including her feisty Irish mother (Liz McCarthy) and shy little brother Winthrop (Owen Hanford), who is self-conscious because he speaks with a lisp. The town is full of larger-than-life characters, such as the self-absorbed, bumbling Mayor Shinn (Mark Linn-Baker) and his gossipy wife Eulalie (Nancy Anderson). There’s also Harold’s old friend and somewhat reformed accomplice, Marcellus Washburn (Todd Buonopane), and the bickering school board members (Joseph Torello, J.D. Daw, Ben Nordstrom, and Adam Halpin), who through Harold’s influence become a frequently singing barbershop quartet. What Harold doesn’t know is that rival salesman Charlie Cowell (Michael James Reed) is out to expose Harold’s scheme, although what Charlie doesn’t know is that Harold isn’t so sure he wants to go through with the scam anymore. This is a show that basically demands ideal casting for its title role, and unfortunately the Muny’s production doesn’t get that. Foster, who was outstanding a few years ago as the Pirate King in Pirates! or, Gilbert and Sullivan Plunder’d, is miscast as the fast-talking Hill. He noticeably struggles with the rhythm on iconic songs like “Trouble” and “76 Trombones” and stumbles over the lyrics in “The Sadder But Wiser Girl” and “Marian the Librarian”. He also doesn’t quite project that sheer spellbinding energy that is essential for Harold Hill, although his performance does improve in Act 2. Shaddow, as Marian, gives a fine if somewhat laid-back performance as Marian, and she has a great voice, although the chemistry between her and Foster is lacking. The supporting players fare better, with truly excellent comic performances from the amiable Buonopane as Marcellus, and from Linn-Baker and Anderson as the Shinns. The real stand-outs, though, are Torello, Daw, Nordstrom, and Halpin who are truly marvelous as the school board-turned-quartet. There’s also an outstanding ensemble and first-rate dancing on production numbers like “76 Trombones”, “Marian the Libriarian”, and “Shipoopi”. Visually, the show looks great. There’s a wonderful nostalgic set by Michael Schweikardt that takes full advantage of the Muny stage’s turntable, providing an excellent effect in “76 Trombones” as the ensemble appears to march throughout the town. There are also excellent, colorful period costumes by Amy Clark, superb lighting by John Lasiter, and strong video design by Rob Denton. This is a wonderful looking show, with some great comic performances and a great ensemble, although some of the alterations to the script are puzzling. For instance, changing the timeline so that Harold arrives the week of Flag Day instead of the 4th of July is not adequately explained. It seems to have been done for no reason other than that the show is being performed during 4th of July week so that the Act 2 “Ice Cream Sociable” can be the “4th of July Sociable”. There’s no apparent “story” reason for the change, and it just comes across as awkward. Still, if you’re looking for a big, bright, musical show with a great old-fashioned score and some incredible dancing, then the Music Man is sure to entertain. It’s not an ideal production, but it does have its moments. The Muny is presenting The Music Man in Forest Park until July 11, 2016. I had no idea what I was getting into when I saw this production of The Music Man, but I thought I did. I mean, it’s The Music Man. Most people with even a moderate knowledge of musical theatre have heard of the The Music Man. Many people (me included) saw the show performed at their high schools or local community theatres. It’s one of the most performed classic musicals in America. It’s a big show with a big cast, and even though I knew this production was by a small-ish theatre company I didn’t really expect it to be this small. It’s so small that it would seem that the essence of the show–a tribute to small town Midwestern America by a man (Meredith Willson) who grew up there–might be diminished, but oddly even though the size of the production was reduced, the atmosphere was not, and in fact the more intimate nature of this production actually added a new perspective to the material that added to my enjoyment of the show. 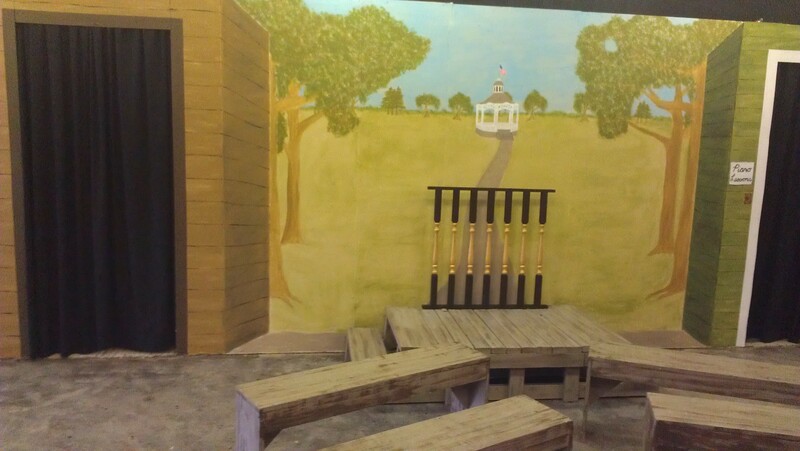 The set by Eric Franklin is simple but effective, with benches and movable set pieces that are changed around to suggest various settings such as a train car, a front porch, a school gymnasium and a library. The cast doubles as the stage crew, in fact. The costumes (by Tammy Franklin) are meticulously accurate, and the 1912 atmosphere is set very well even with the minimal scenery. For such a tiny production, the attention to detail in terms of setting is quite remarkable, and it lends an air of authenticity to the proceedings. The intimacy of the production allows for a conversational feel to numbers such as “Rock Island”, which also—in a clever bit of staging that I had never seen before—allows Harold Hill (Darren Chilton) to speak his own words of introduction, unbeknownst to the salesmen around him. The salesmen are played by the same actors who turn up later in the show as the quartet and townspeople, and that works very well. Other adjustments to the staging included having the Paroo house scenes entirely staged on their front porch, with piano student Amaryllis offstage during “The Piano Lesson” and most of “Goodnight My Someone”. This staging makes the songs more of a showcase for Marian and her mother. Other settings such as the footbridge and the ice cream social work very well with this small set, and the overall feel of the piece is one of familiarity, like the audience is invited to experience this small town and get to know these characters in a more direct way than with some of the larger productions. Also, the choreography of some of the usually-larger numbers such as “76 Trombones” and “Shipoopi” has been adapted to the space and cast size to make these numbers focus much more on the relationships between the characters than large-scale spectacle. I especially loved the “Marian the Librarian” sequence, in which the focus has been directed almost entirely on the elaborate “cat and mouse” game between Harold and Marian. It’s very well staged and well danced by all of the players. The performances are “smaller” than usually seen in this show, as well. 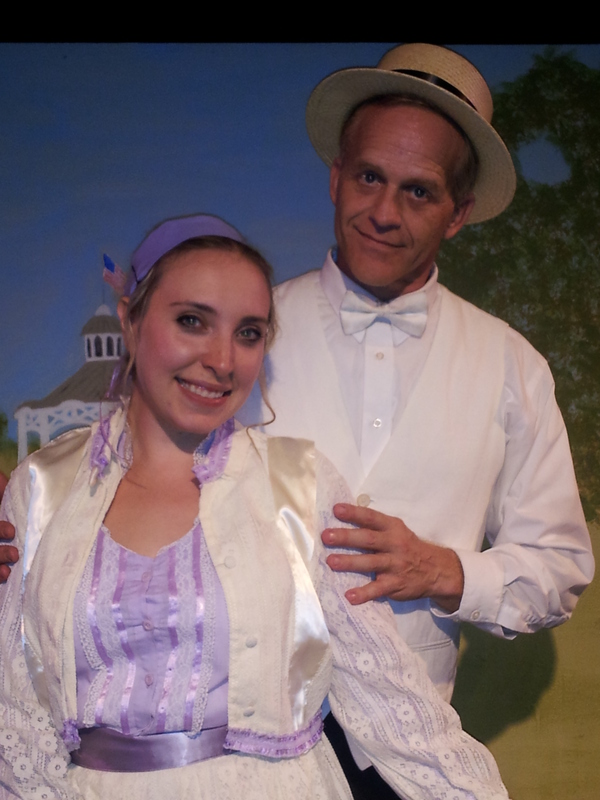 Some characters who are larger than life caricatures in most productions—like Mayor Shinn (Charles Kolar) and his wife, Eulalie (Tammy Franklin)—are brought more down to Earth in this production. They are still comic characters, and very well-played, but these are characters that seem more accessible somehow, like people you would actually meet in small town America in 1912. Nothing is cartoonish here, and it lends a sense of realism to the show that isn’t always there in larger productions. The smaller scale also lends a sense of camaraderie among the townspeople that adds to the authenticity–this a very believable small town with townspeople who all know each other. It’s not difficult to imagine that these people are familiar with all the goings-on in the town. The show’s central relationship, between con man Professor Harold Hill and town librarian and music teacher Marian Paroo (Natasha Gleichmann) is ideally represented here. Chilton is a suitably charming, smooth-talking Hill, and Gleichman lends an air of toughness to Marian in the earlier scenes that makes her later softening even more effective. The pair’s chemistry is very good, especially in the second act as their relationship grows, such as in the wonderful moment just after “Shipoopi” in which it becomes clear that Harold, who had previously seemed so sure of himself, is actually starting to lose track of his “game” and fall for Marian’s charms. Chilton is appropriately winning in songs such as “Trouble” and “76 Trombones”, and Gleichmann with her clear, strong soprano, is in excellent voice on “Goodnight My Someone”, My White Knight” and “Till There Was You”. Other stand-outs in the cast include Charles Burden in a winning turn as Harold Hill’s erstwhile partner-in-crime, Marcellus Washburn, and Malissa Silvey as Marian’s mother Mrs. Paroo. Both show excellent comic abilities and great stage presence. There are also some strong performances by the younger cast members including Caylin West as Amaryllis, Carter Novinger as Marian’s brother Winthrop, and Cole Franklin and Lizzi Bennett as teenage sweethearts Tommy and Zaneeta. The barbershop quartet (Ian Post-Green, Glenn Brackett, David Novinger and Aaron Paschall) are charming and in great voice, and the Pick-a-Little Ladies (Kathy DeWitt, Jennifer Novinger, Jaclyn O’Hara and Amanda Pouiliot) lend excellent support as well. That all said, there were a few slight issues with line flubs here and there and somewhat clunky set changes and a backstage mishap with that resulted in a (very well-covered) trio performance of “Lida Rose”. There were also a few projection issues with some of the younger cast members, but overall it was a thoroughly entertaining, very different production of a time-honored classic show. The whole perspective of the show seemed to have been shifted toward highlighting the relationships between the characters, particularly Harold and Marian, and Marian and her family. It’s a family show, not just for a family audience but there was a real sense of connection among the cast and crew that added real charm to this production. I’m glad I got the chance to see it, and if you’re in Denver in the next few weeks I highly recommend checking it out.